1. Open the faucet till you get a steady, thin stream of water. 2. Inflate a balloon and tie it securely. 3. Now take the balloon and rub it vigorously on your head for about 15 seconds. Move it away. 5. Your hair should be standing on end (upright). 6. Now take the balloon near the stream of water, but ensure that the balloon does not touch the water. 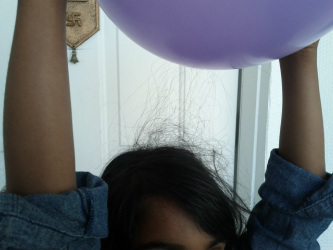 The balloon is attracted by the static electricity you built up by rubbing your hair against it!When you rub the balloon against your hair, you are transferring electrons, or negatively charged particles from your hair to the balloon. This makes your hair stand up. Water has both positive and negatively charged particles and is neutral. The positive and negative charges are attracted to each other. When you move the negatively charged balloon towards the water stream, it attracts the particles in the water that are positively charged particles, causing the stream to bend. 2. Try the same experiment, but use a comb instead of a balloon. 3. Does the balloon or the comb make the water bend more?